A dream to fly is fulfilled in an unexpected fashion. Ursa the bear stands out from all her classmates due to her exceptionally vivid imagination. Where others draw in black and white, Ursa paints in full color. Where others limit the sizes of their projects to what can easily fit in their hands, Ursa constructs a solar system that radiates from her head. Nighttime dreams awaken an even bigger and better goal. 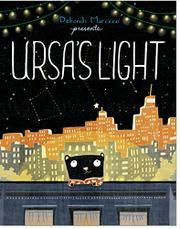 Ursa will fly. She carefully observes animals and machines that fly, then diagrams, builds, and tries, only to meet with repeated failure. Then a sign for a stage show in New York City’s Central Park reawakens her ambitions, and with visions of the eponymous constellation in her head, she auditions as “the most dynamic shooting star anyone had ever seen.” Success comes, albeit on the stage with glowing lights overhead and flowers strewn at her feet rather than in the air. Marcero, in her debut picture book, has constructed a little story about imagination in which success comes to those who try, try, and try again. Visions of nighttime travel amid the stars have morphed into stage stardom. Unfortunately, the mostly darkly toned artwork and the bears’ oddly shaped, squared-off heads lack appeal, and the busy pages require sustained viewing to decode.